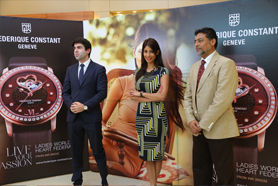 Frederique Constant launches collection at “Swiss Watch Boutique”, Lulu Mall Watches with a Heart Unveiled! 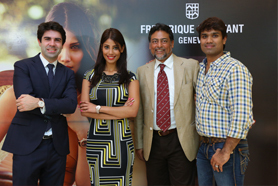 Frederique Constant, the ‘accessible’ Swiss luxury Watch Brand today unveiled its collection at Swiss Watch Boutique in the famous Lulu Mall.The inauguration was done by the brand ambassador of Frederique Constant, Ms. Nicole Faria; Ms. India 2010 and Ms. Earth 2010. Also talking to the media was William Besse, International Sales Manager, Frederique Constant. Williams said, “We are very happy to be showcasing our collection at this wonderful store, The Swiss Watch Boutique. We are really looking forward for the brand to get popular with watch lovers of Cochin!”. Showcasing some of their master pieces, William added “the strategy of Frederique Constant is to let more people enjoy luxury so it is positioned under the accessible luxury segment. We are doing everything to make our watches look like very expensive and very high-end but at the same time the price is very affordable. Collection that was showcased at the store was the “Ladies World Heart Federation” Automatic Collection. This unique and beautifully designed model supports the “Hearts of Children” campaign. The new models are inspired by the FC-310 and FC-303 automatic winding movement, providing exceptional accuracy, reliability and durability, with 38 hour power reserve and water resistant to 60 meters. The bezel of each model is set with 48 sparkling diamonds, totalling 0.74 carat. Even more diamonds are used as indexes, set on a vanilla dial with a guilloché World Heart Federation logo at its centre, and surrounded by a delicate mother of pearl on the outer ring and they are priced attractively at approx. INR 2.9Lakhs. Frederique Constant has been involved in heart related charities since 2009. One hundred watches will be produced and donated to the World Heart Federation member organizations to support their actions aimed at preventing cardiovascular diseases (CVD) in women and children around the world. To create more visibility for their brand and the slogan ‘Live your Passion’, the FC team interacted with some of the mall walk-ins. Amongst dance and games, FC team gave away prizes to enthusiastic participants. Williams concludes that in 2014 Frederique Constant will push for implementing manufacture collection in India and also spread awareness about manufacture watches and to work closely with retailers.